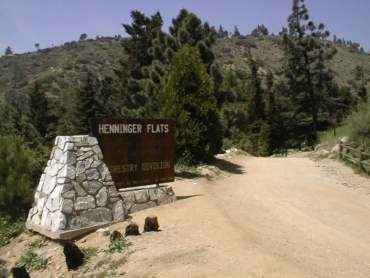 Henninger Flats, at 2,600' above sea level, can be seen from the parking lot at Eaton Canyon Park. It is the lowest flat area with conifer trees between the nearest peaks to the northeast. While there, take advantage of the picnic area and Visitor's Center. There is also a plant nursery on the premises. Be aware that there is little or no shade along the trails until you reach the Flats. Henninger Flats has no flush toilets and no drinking water. There is a pit toilet available. 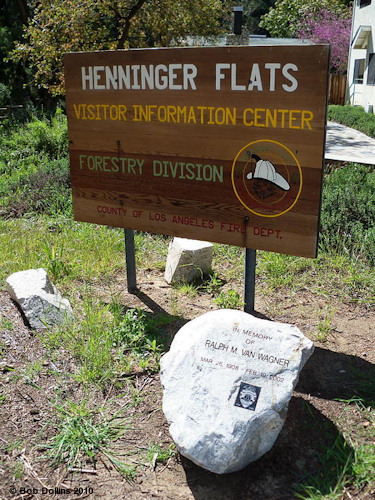 For more information or to find out how to obtain camping permits please contact the Henninger Flats visitors center at (626) 794-0675 or contact the Angeles National Forest at (626) 574-1613. Mount Wilson currently has no drinking water and no restrooms available due to drought. From the parking lot, walk north across the wash and turn left (north), then walk approximately one-half mile to Walnut Canyon and climb the steep, windy horse trail, which meets with the Toll Road. Take the Toll Road uphill (total distance: 3 miles each way - very strenuous). Take the Toll Road all the way from the Pinecrest gate (total distance: 2.7 miles each way - fairly strenuous). To get to the Pinecrest gate, go north on Altadena Drive one mile past the entrance to Eaton Canyon. Turn right on Crescent, then right again on Pinecrest. Observe parking signs carefully.